Four-time champion Lleyton Hewitt and former world number one Marat Safin are among the latest players to confirm they will play at Queen's Club in June. They will join world number one Rafael Nadal, Britain's Andy Murray, and four-time champion Andy Roddick at the Aegon Championships from 8-14 June. Nikolay Davydenko, David Nalbandian, Gilles Simon, Gael Monfils, James Blake and Richard Gasquet are also confirmed. Hewitt won the title at Queen's Club in 2000, 2001, 2002 and 2006. "It's a really prestigious tournament," said the Australian. "It's a fantastic atmosphere and for me it's even better because I've had so much success there. "We're fortunate to play on some of the best grass courts in the world at Queen's. "The year that I won Wimbledon I had beaten Tim Henman in the final at Queen's and it gave me a lot of confidence on grass so I was really confident going in. I was able to take that into Wimbledon." Roddick is the other man to have dominated the event in recent years with victories in 2003, 2004, 2005 and 2007. "I'm excited about my prospects this year," said Roddick. "To be honest I haven't played my best tennis at Wimbledon over the last couple of years. This year I'm playing better and moving a little bit better." Roddick's coach Larry Stefanki, who joined up with the American this year, said: " I think he's as capable as anyone to win on the grass, and I'm talking Wimbledon. "If he can serve with the variety that he's serving right now, put himself in a position to move into the court more, play on the baseline on the return of serve and attack a lot more, I think the window of opportunity is very big for him at Wimbledon." Nadal beat Novak Djokovic in last year's final before going on to win his first Wimbledon title. "It is a special place. You feel like you are in a club, a real tennis club, so that is really nice," said the Spaniard. "Playing the Aegon Championships means that you are already in London, the courts are in perfect condition like at Wimbledon and so it is always a pleasure to play there. "The atmosphere is always really good and the crowd has always been really nice with me. I just want to say 'thanks very much to all the fans in England'." Nadal arrived in London last year on the back of his fourth successive French Open title and swiftly made the transition to grass, becoming the first player ever to win at Roland Garros, Queen's Club and Wimbledon in the same year. "It was amazing," he said. "It was totally unexpected for me to win after winning in Roland Garros. I arrived and all I had was one day to adapt to grass. "But I played really, really good tennis. I played relaxed, without pressure and I played really well." Three weeks later the Spaniard triumphed 6-4 6-4 6-7 (5-7) 6-7 (8-10) 9-7 against Roger Federer in one of the greatest ever Wimbledon finals. "I remember I had a lot of nerves the night before the match," said Nadal. "And then, during the match there were a lot of emotions. In the beginning, I had the match under control and I had match points. 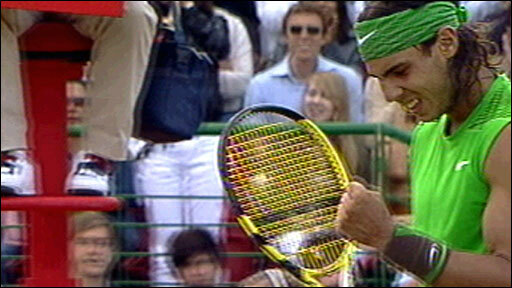 But he came back very good in the third and fourth sets and had the break point in the fifth set at 4-3. "He had his chance there. I saw the match on TV for the first time last week. It was really amazing." British number one Murray will appear at the event for the fourth time in his career, having claimed his first ATP win there in 2005. Last year, Murray withdrew ahead of his quarter-final clash with Andy Roddick because of a thumb injury. "Grass is a good surface for me and obviously it would mean a lot to me to win a tournament at home," said Murray. "All the guys that have played well at Queen's tend to have gone on to do well at Wimbledon so it's a good marker to see where your game is at. "The tournament has got an unbelievable history and all the guys use it as pretty much the perfect preparation for Wimbledon. I think this year I've got a good chance of doing well."